Sensor Clean. Liquid cleaner for sensor. Sensor Clean™ has many characteristics that make it an excellent choice for cleaning your sensor. While it is best used on water based stains and light dust contamination, it also provides excellent dust repellent properties and anti-fogging capabilities. 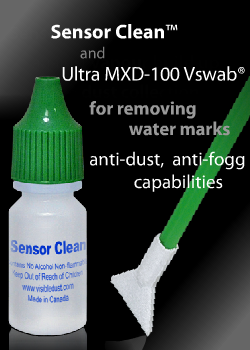 Sensor Clean™ works best with VisibleDust MXD-100 Green Swabs. 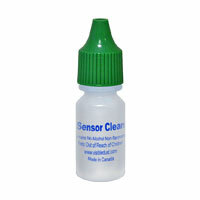 VisibleDust liquid cleaners (Sensor Clean, VDust Plus and Smear Away) when used with VisibleDust Sensor Cleaning swabs are safe and effective on ALL digital SLR and mirrorless cameras including: Canon 400D, Canon 40D, Canon 1D MKIII, and Canon 1Ds MKIII, Nikon D300, Nikon D3 and Alpha Sony 700.